Chromolithograph. Intermediate pages composed of prinited text. 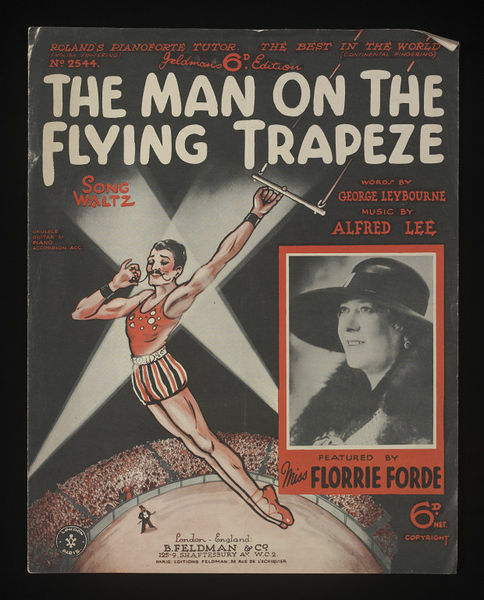 Music sheet for The Man on the Flying Trapeze words by George Leybourne, music by Alfred Lee, sung by Miss Florrie Forde, published by B. Feldman & Co., London 1934. Given to the Enthoven Collection by N.O.D.A. Music sheet for The Man on the Flying Trapeze words by George Leybourne, music by Alfred Lee, sung by Miss Florrie Forde (1875-1940). 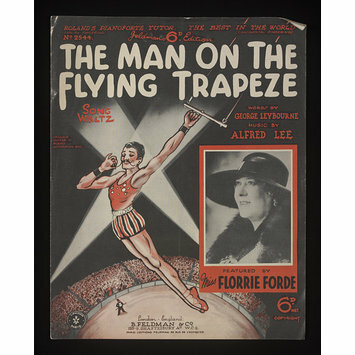 Feldman's 6d Edition no.2544, illustrated with an image of a Victorian mansuspended from a trapeze, and an inset photograph of Florre Forde. Published by Bert Feldman & Co., London 1934.